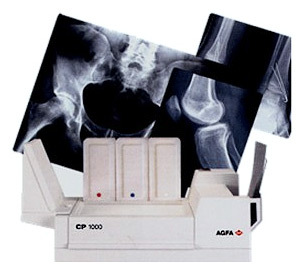 AGFA CP 1000 - device for developing radiographic, fluorography (X-ray of the chest) and mammography images. It is unique because it does not require connection to the water supply. For work it uses special tanks, which are included in the supply package. Due to its mobility AGFA CP 1000 is ideal for any diagnostic departments, military field hospitals and veterinary offices. This device provides high quality film processing in sizes from 4"x4" to 14"x36". CP 1000 in operation mode consumes 400W, but consumption in the standby mode is reduced to 100W. To reduce power consumption, the device can be switched off. For further switching on it quickly restarted and is ready for use after 7 minutes. 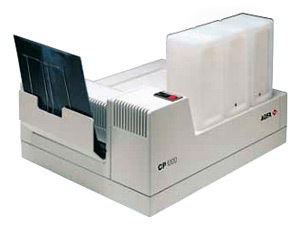 CP 1000 uses an infrared drying instead of the usual hot air drying. This allows quickly drying of the printed images, and also minimizes noise and power consumption when machine operates. It is also possible to control the drying temperature using a switch. Containers with chemicals, as well as transport rollers are covered with a special lid. This ensures safe operation for the medical staff. To clean the machine just open the lid, remove the rollers, to remove and wash the guide plates and chemical containers. This process will take a few minutes. CP 1000 does not require professional installation. Setup and installation takes less than one hour and requires only simple tools. Developing machine meets the security requirements security VDE 0720 and VDE 0730 and the RFI rules VDE 0875. Socket connection to the water supply meets the requirements of drinking water supply.